Lead singer of the Beach Boys, Mike Love, will receive PPB’s Art Gilmore Career Achievement Award from President “Shotgun Tom” Kelly at the Airtel Plaza Hotel in Van Nuys on May 17. Grammy® Winner and Rock and Roll Hall of Fame Member, Michael Edward Love, grew up under the Southern California sun where he soaked up a life of music, surf, sand and sport. Beginning his singing career as a young boy, Mike along with his cousin, Brian Wilson, frequently sang at family get-togethers and holiday gatherings. These early influences served as the inspiration to form the legendary group, The Beach Boys, which originally consisted of Mike and his cousins, Brian, Dennis, and Carl Wilson along with neighbor David Marks and High School friend Alan Jardine. In 1990, Mike was the first artist to respond to President George H. W. Bush’s call for service as part of the Thousand Points of Light Initiative. Mike began StarServe, “Students Taking Action and Responsibility to Serve,” enlisting high profile celebrities to inspire young people to serve their communities. More than twenty years later, Mike continues his commitment to young people. Mike is also a longtime supporter of environmental causes. In 1992, Mike was a speaker at the Earth Summit in Rio De Janeiro, and again on Earth Day 2000 on the Mall in Washington, D.C. In 2002, Love proudly carried the Olympic torch for the Salt Lake City, UT Olympic Games. Throughout his career, Mike has co-authored more than a dozen Top 10 Singles, cementing The Beach Boys legacy, alongside The Beatles and Michael Jackson, as the only artists to have produced twelve Top 10 Singles within five years. Today, Mike is happily married to Jacquelyne Love, and is the proud father of eight children. Mike primarily resides on the North Shore of Lake Tahoe. He continues to enjoy life on the road, performing over 150 sold-out shows a year all over the world. Radio veteran and music legend, Art Laboe, coined and trademarked the phrase “Oldies But Goodies™”. In September 2018, he celebrated 75 years on air as an active radio performer, marking the longest continuous period of broadcasting service. Art was one of the first DJs to play Rock and Roll on Los Angeles/West Coast radio in the 1950s, was the first to do dedications on the radio, and the legend continues with his current nightly syndicated radio show, The Art Laboe Connection, which is heard on 93.5 KDAY Los Angeles Sundays 6pm-Midnight, also Monday-Friday 9pm-Midnight on KOCP 104.7 Oxnard/Los Angeles, KQIE 104.7 Riverside/San Bernardino, KMRJ Jammin’ 99.5 Palm Springs, and many stations throughout the Southwest. He is also heard nationwide on the Internet through www.935KDAY.com and www.OldSchool1047.com. Art Laboe is widely known for creating the oldies format in radio, and in music he innovated the compilation album with his Oldies But Goodies™ 15-volume album series. In connection with his radio show, Art hosts annual concerts throughout California, Nevada and Arizona. His many awards include: A star on the Hollywood Walk of Fame in the category of Radio; Art Laboe Day, declared by the City of Los Angeles on July 17, 1981; inducted into the National Radio Hall of Fame in 2012; Art Laboe Day proclamation by the County of Los Angeles Board of Supervisors on August 4, 2015; the 2005 Hollywood Arts Council Charlie Awards Media Arts Award; the Pacific Pioneer Broadcasters Diamond Circle Award; National Hispanic Media Coalition Lifetime Achievement Award; and Palm Springs Walk of Stars honoree. Art's dream is to become an author in the coming year or two, by releasing a book he has been working on for decades. 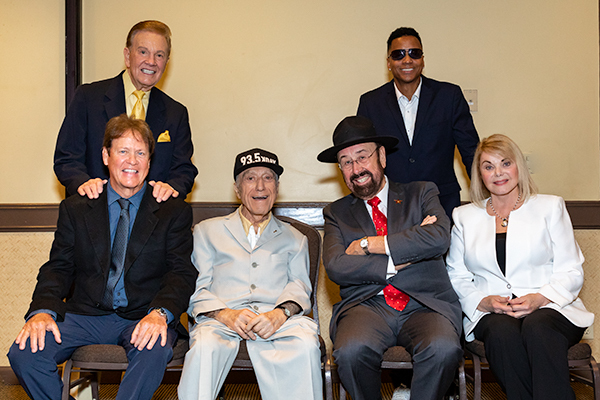 He continues his humanitarian work through his Art Laboe Foundation with donations to animal charities and scholarships for many high school students. Would you like to join the PPB and attend the Mike Love Luncheon on May 17, 2019? If you have worked in Broadcasting or in any related field for 10 years or more, please e-mail our Membership Committee with your request to join us to honor Mike Love. Please include your name and daytime telephone numbers. PPB Members receive their Luncheon Notice and Reservation Form by mail before the date of each luncheon, and send in their request for table seating along with their check.